The Tan Bark Trail starts in a coastal canyon and then ascends a steep hillside that burned in a major forest fire in 2008. 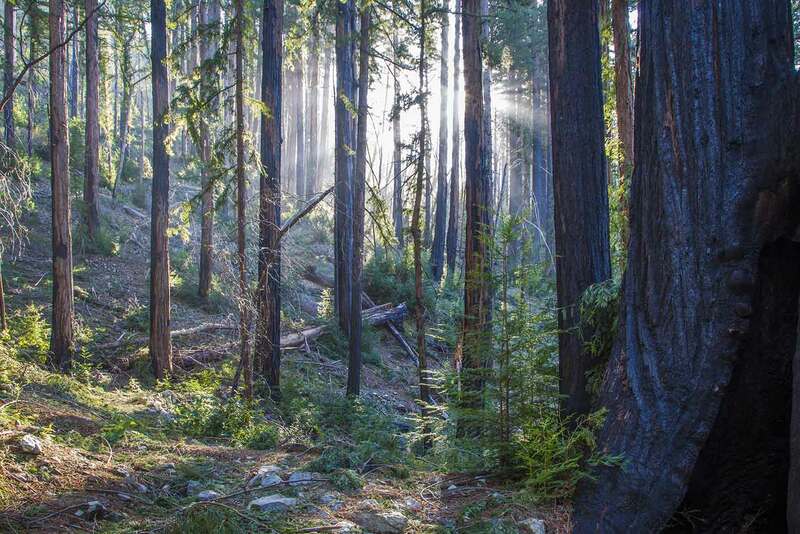 As a result of the fire, the trail is a lot more interesting and enjoyable than it used to be: a dense and rather monotonous forest containing a lot of dead tanoaks has given way to a series of flower-filled meadows alternating with redwood groves and open hardwood forest. The trail can get overgrown, but thankfully there isn’t much poison oak. Downed trees are common, especially after windy days. 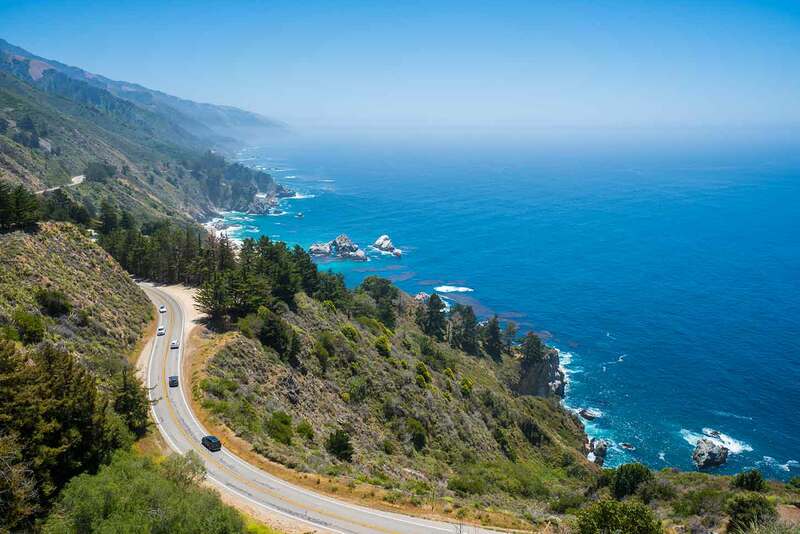 After reaching an abandoned house, you can descend back to Highway One on an even steeper fire road that features spectacular coastal views. 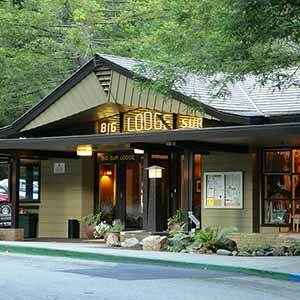 To find the trailhead, which is unmarked, begin at the McWay park entrance and drive north on Highway 1. The road climbs and after a mile you’ll come to a vista point. The road then descends for a mile and makes a hairpin turn before starting to climb again. At the hairpin turn you may notice some cars parked at a large turnout. 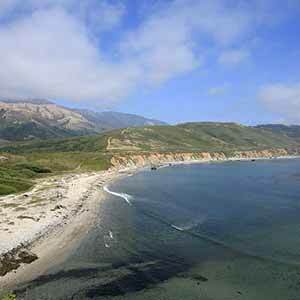 Just north of the turn, an unmarked, gated dirt road to your left leads to Partington Cove. To the right is the Tan Oak Trail, also unmarked. 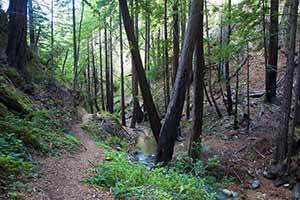 For its first half-mile, the Tan Bark Trail runs along the bottom of a redwood-filled canyon. Despite a plush carpet of redwood sorrel, the canyon has the somewhat disheveled look that’s characteristic of logged forests. 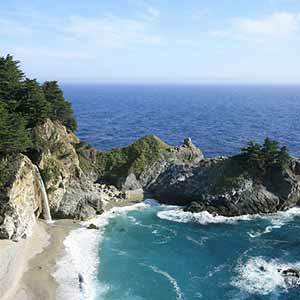 This ends when the trail makes a hairpin turn and begins a classic Big Sur climb up the side of the canyon. The climb is steep at first but then becomes more reasonable; overall it’s 2.8 miles at an average grade of 13%. As it climbs the scenery alternates between brushy meadows and redwood-filled ravines. 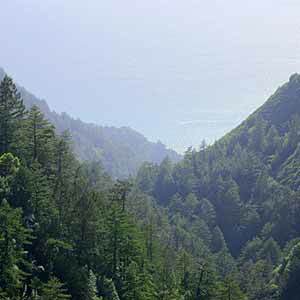 There are occasional glimpses of the imposing conifer-streaked hills towering above, of the canyon, and of the ocean. 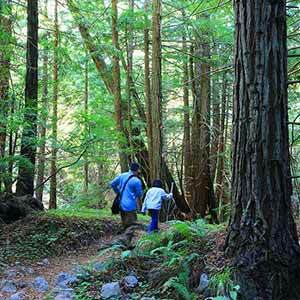 The most scenic redwoods can be found in the quarter-mile before the trail reaches its easternmost extent. Here the trail enters a high-elevation grove of small to mid-sized redwoods, located in a small glen with a little brook flowing through it. 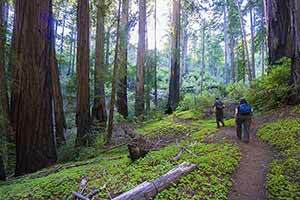 The trail then leaves the redwoods and ascends through meadows alternating with hardwood forests. At the highest point of the trail, an overgrown, poison oak-infested unofficial trail branches off, climbing towards a ridgetop viewpoint. The main trail then begins to descend and soon ends at the fire road. To your left, the fire road descends a short distance to the Tin House. 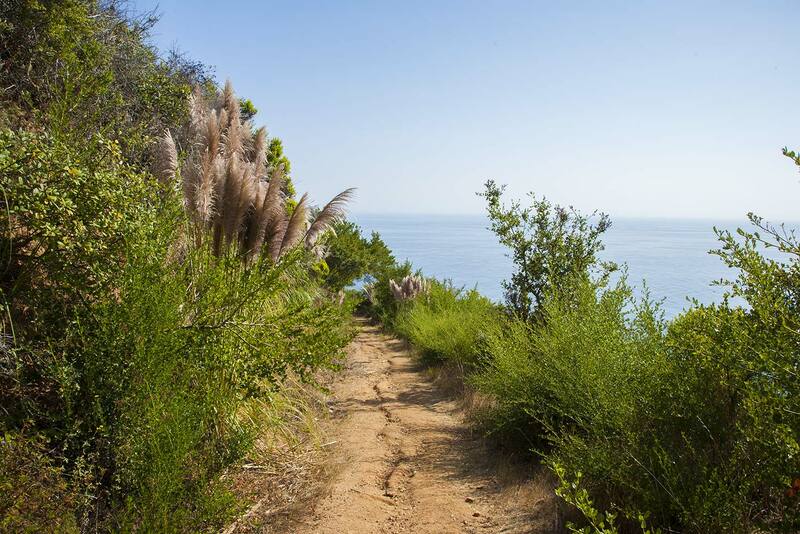 Just after a hairpin bend, there’s an unsigned connector trail (previously known as the Waters Ridge Trail) that descends to the Ewoldsen Trail with superb coastal views. It’s worth going at least a few yards down this trail, since it offers the best views of the hike. In the other direction, the fire road descends to Highway One. There are some views of Partington Canyon to your right, but these are spoiled a little by a housing development on the opposite wall. 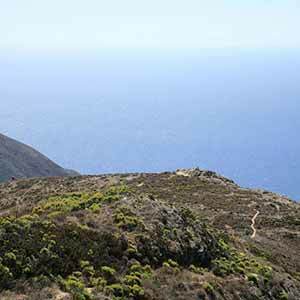 The scenery makes an abrupt change for the better when the trail rounds a bend, revealing a sweeping and dramatic view of the coast. The trail descends through chaparral that’s an unusually brilliant green and is strewn with wildflowers throughout the summer. A thousand feet below, the ocean is a huge, glittering blue plain. The sounds of the surf emanate up from the shoreline. The road curves through a tiny but pretty redwood grove just before ending at Highway One, a few yards south of a vista point. It’s possible to walk back along the highway, but its occasionally narrow shoulders combined with wide, fast-moving RVs make this a hazardous walk. At one spot with an almost nonexistent shoulder, the road is banked such that the oncoming RVs actually lean toward you.